Royal Blue 5 piece slim fit bow tie suit for baby boys, toddler or older boy, perfect outfit for any special occasion including a christening, wedding or formal occasion. 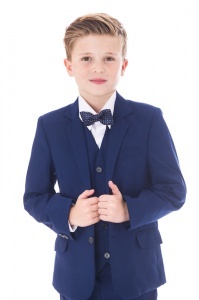 Jacket: Fully lined royal blue slim fit jacket, double pockets on front with single breast pocket, two centre buttons with buttons on cuffs. 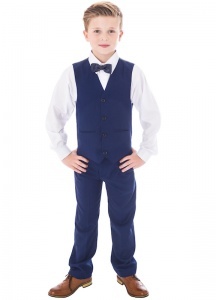 Waistcoat: Fully lined plain royal blue slim fit waistcoat, double pockets, 3 centre buttons, adjustable strap/buckle on back for perfect fit. Trousers: Pleated royal blue slim fit trousers, double pockets, belt hoops, elasticated on rear for the perfect fit. Bow-Tie: Luxury satin bow-tie, pre-tied for the perfect knot every time, complimenting the suit perfectly. 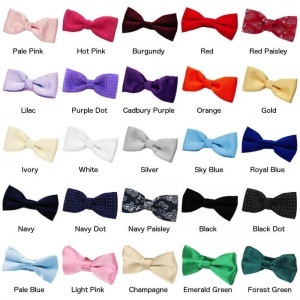 Choose from over 20 colours (image shows a navy dot bow-tie). 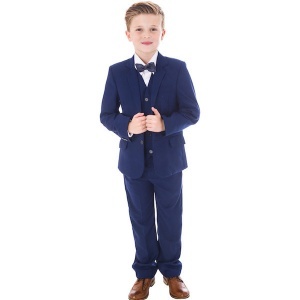 This royal blue 5 piece slim fit bow tie outfit will make him look like the perfect handsome gentleman at a christening, as a pageboy / wedding guest or a special occasion. 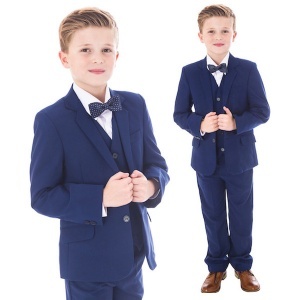 Sizes 0-3 months to 14 years. I bought this suit for my son's first birthday, I must say that it looked so lovely on him. Quality material and very good fit for my son. Will definitely come back to this site to buy him more suits.